You know what the biggest bummer in motorsports is? After you’ve poured your heart and soul, countless hours of preparation, and of course barrels of money into your racecar, it’s gonna fail! That’s right, from the moment of creation every system is literally trying to destroy itself. Every shift chews up synchros, gears, and clutches; every lap wears out rings, bearings, rotors, pads, and tires (ughhhh!). Nearly every component will eventually just give up and quit on you! Of course you try to develop each system to “make it to the end,” whatever that particular end may be, and oftentimes at the finish line it’s the guy with the least amount of problems/failures on the top step of the podium. As drivers we sort of mimic our racecars. We try to develop our skills to match our desired racing goals. We’ll read books, watch videos, go to driving schools seeking professional instruction, maybe hire private coaches, even exercise — all trying to make ourselves a bit faster (and hopefully safer). However, the number one thing we need to reach our goals in motorsports is seat time. Now this is where the second biggest bummer in motorsports lies: the more time behind the wheel we spend, the closer we are to our next crash! I hate it, but it’s the god honest truth, and I don’t know many folks that are successful in motorsports that haven’t had an “off” or had someone “put them off.” Now I’m not suggesting that any of you fine folks reading this ever make driving errors or go over the limit, but those other guys, darn it, well, you’ve just got to watch out for them…. Over the years various trends in motorsports have stood out. There were the 80s with crazy aerodynamics, the 90s with forced induction, and the 21st century with affordable data acquisition and video. But I think a trend that has really peaked over the last 10 years has been safety. If you look at the average driver at a club event today, he’s wearing nomex socks and underwear, a two-layer driving suit or better, and he’s strapping on a full face helmet just after sliding on his HANS device. When he gets in the car he’s most likely in six-point harnesses and a halo seat with a window net — and he can reach both fire and kill switch buttons. In addition his car is equipped with a full rollcage. We’ve come a long way from leather lapbelts and goggles, and rollcage design has evolved as much as any other safety feature. 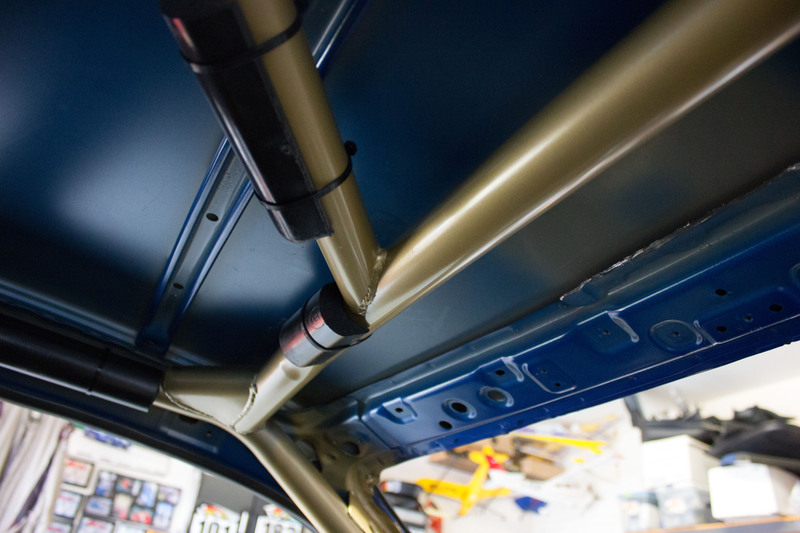 Let’s take a look at what’s involved in the design of a modern rollcage. The premiere racing organizations spend a fair amount of resources investigating the best and safest designs, and the professional sanctioning bodies have a rule-set already in place defining the basic design of the rollcage. We directly benefit from a trickle-down effect. Fortunately, all our clubs have adopted the basic design, which makes it possible for you to race your car with the POC this weekend, and then race with another organization the following without having to make any changes. That said, there’s still a fair amount of freedom given to the builder to create something unique both in safety and strength. I used to get calls that went something like this: “Hey, what’s the bottom entry level price for a rollcage, and what does it weigh?” People today are very educated about safety and design, which makes for safer and stronger racecars. So the first questions now are, “How much rollcage do I need, and how can we make the car stiffer while minimizing weight?” I always joke with, “Well, how hard do you plan on crashing?” It’s an educated guess, but I start by assessing risk, looking at the car’s overall speed, and then considering the character of the racing series. For instance, the amount of tubing needed in a 165 mph GT3 is greater than what the Spec 944 car is going to need. The GT3 is typically going to go off at a higher speed than the 944. Now if you’re racing in a series that’s modeled after a bumper-car race like the British Touring cars or Grand Am’s feeder series, Continental Sports Car Challenge, then you’re going to need massive amounts of protection. If you’re racing Spec Miata at Infineon raceway up north where you can hit a wall and destroy a racecar in nearly every turn because of the track’s nature, you’re gonna need more bars. Finally, if it’s a more complex build where the car has been acid dipped and cut to shreds to remove weight, then adding more cage helps strengthen and stiffen a flimsy shell. The first freedom we’re given (in most instances) is the type of material used. In America you’ll come across three different types — mild steel, DOM, and chromoly. The differences among the three are in the processes by which they are made, and the amount of carbon/alloy in the material. Mild steel — also known as ERW — is typically a flat sheet which is rolled and then electronically welded together, leaving a visible seam. DOM goes through a similar process and then is cold-drawn over a mandrel giving it more integrity, and the seam is hidden which gives the tubing a seamless appearance. Chromoly is extruded, and along with DOM is much truer in thickness and diameter than the ERW. Weightwise, the three types are nearly identical. There is a common belief that chromoly is lighter — it’s not. Strengthwise, however, there is a huge difference between the mild steel and the other two. The mild steel has a low carbon count, making it more bendable, while the DOM may have more carbon and has been “trued up” by the mandrel, making it much stronger; and finally chromoly has alloy blended in with an even higher carbon content, giving it a tad more strength and rigidity than DOM and nearly twice that of ERW. ERW has not been legal to construct with for over 10 years now, but I wanted to include it to show how much stronger DOM and chromoly are. So that leaves us with DOM and chromoly. The moly is a bit stronger and more rigid than the DOM. This has both benefits and drawbacks. It does make for a more rigid chassis, but it has more tendency to crack during an impact; and more importantly, it transfers more energy to the driver during a hard crash. DOM, being less rigid, absorbs more of the impact, giving more “cushion” to the driver. Perhaps that’s why several organizations don’t allow chromoly anymore for new builds. We build probably 30 DOM cages to every one chromoly (unless it’s offroad racing — then it’s 50/50). The second freedom is tubing size; for most of us it’s going to be a choice between 1¾” x .095 wall and 1½” x .120 wall tubing. Generally speaking, the larger 1¾” diameter is going to be stronger in both tension (trying to pull a tube apart) and compression (trying to compress it from the ends). Also it’s just a tiny bit lighter. However it’s more difficult to fit into tighter cars because it’s bent using a larger radius die, and it’s not as strong in shear, meaning the tubing will crush easier in side impacts. It’s a tossup for most of us, and I can tell you it’s much easier to get the 1½” into tighter, smaller cars, especially when larger drivers are involved. Considering that the wild end-over-end flips that SPEED likes to showcase during commercials are few and far between compared to driver-side door impacts, it makes the decision more challenging. We build 60% of our roadrace cars from 1½” tubing and 40% from 1¾” tubing, and rallycars are probably 90/10 with the 1¾” material). The third freedom given to the constructer is the choice of welding. For most of us it’s going to be either MIG or TIG welding. MIG uses steel wire fed through a “gun” mixed with argon/CO2 while TIG uses a rod and “electric” torch with various gases cleansing the weld area. A TIG welder has a little bit better control of the heat, which can be modulated during the process, while the MIG welder’s temperature is fixed before the process is started. The MIG joints usually have a wider weld bead covering more area of the joint, while the TIG process requires a cleaner material and more precise notch, leaving a much smaller weld bead and affected area. Done correctly, both processes are equally strong and safe, and both are pleasing to the eye. I think as racecar drivers we enjoy looking at pretty weld beads — it’s in our DNA! Over the years, I’ve discovered it’s much easier to hide an improper TIG weld than MIG joint, and consequently we’ve seen more failures in TIG welds in crashed racecars. In my shop we primarily construct our cars using the MIG process (probably 25 to 1) because of the cost savings and safety that are passed on to our customers. The design of the cage is usually determined by the sanctioning body; however there’s certainly room for creative freedom. First off, to maximize the envelope of safety for the driver, the cage has to be fit snug up against the car’s shell, against the A-pillars and the B-pillars, and all around the driver. You want the most clearance around the driver’s head and body. Having the cage up against the shell also helps reduce flex and stiffens the chassis. I see cars in which I can stick my fist between the roof and mainhoop, or worse, between the A-pillar and mainhoop by the driver’s head. To me a poor fitting design is a sign of a lazy or inexperienced fabricator. The joints have to be mitered correctly and welded completely all the way around. This takes some skill. If the cage is touching the body or roof where it’s supposed to be, there’s no room to weld! We’ll usually build either a box under the mainhoop and A-pillar or drill a hole in the chassis so that we can lower the cage down, weld the tops, then raise it back up on the box or slide a floorplate under the cage, covering up the hole. Additionally the floorplate or box needs to be on at least two surfaces (floor/sill, rockerpanel top/side) and have adequate surface area to distribute the force applied in the crash so as to not tear through the body. From years of seeing roofs crack and cars roll, we’ve realized that the roof area up front is the first to fail and crumple, so we like to use gussets in the roof spreader area. A gusset more than triples the strength of the joint, adding significant safety for the driver. If allowed, we tie the A and B-pillars to the chassis; triangulation throughout the cage is a must to help spread the applied forces of an impact. Doorbar design on the driver’s side in a car that races wheel-to-wheel should have a NASCAR doorbar or a gusseted X, period. We prefer the NASCAR design, and when we do Xs we use two continuous bars rather than a broken X so the driver doesn’t get skewered during a hard hit. Ok, so you’ve decided on a 1¾” x .095 DOM, MIG-welded, triangulated, gusseted rollcage with a pretty two-tube, GT3 style boxed-in X in the driver’s door going through the front bulkhead, tying into front and rear strut towers. That’s a mouthful! So what’s this thing gonna cost, you ask? I can tell you that 1¾” DOM is between $5 and $6 a foot, and a typical cage uses about four 20-foot sticks, while the “fancy” cages use five sticks. At $100 a stick for tubing, plan on a $400-$500 material cost. When you show up with a gutted car (interior removed), labor for a bare bones MIG’d cage at our shop is about 20 hours or about $1500. So an entry level cage would be in the neighborhood of about $2000. The cage described above is about a 32-hour build, or about $2900 with material. 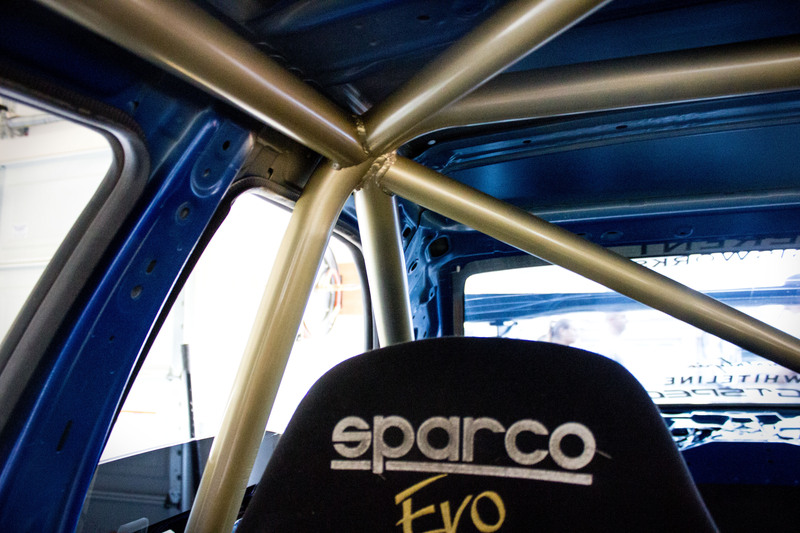 A complete rallycar FIA cage, which requires an extra stick of tubing, is about $3500. Add $750-$1000 more for a TIG’d cage, and another couple hundred if you want chromoly. I’d be nervous about a shop that says they can do the whole job for $1500 and suspicious of the shops charging $6000 unless they’re removing interior pieces and installing seats and other safety equipment. The bottom line is, you get what you pay for, and in the end, what’s your safety really worth? This entry was posted in Safety and tagged cage, guest post, jim pierce, pierce, pierce motorsports, roll cage, roll cage 101, rollcage, safety, safety series, track safety. Bookmark the permalink. can there be a compromise of a street cage that can be use on the track? I want the back seat to be used still with a cage on my bnr32. The reality is that if you want a cage but want to drive it on the street or should I say without a helmet you should only do a backhalf (B pillar back) but in doing so you should not have passengers ride in the back section as the bars in an accident will likely cause them great harm or death. If you want to use it for transporting stuff then it would be fine though.